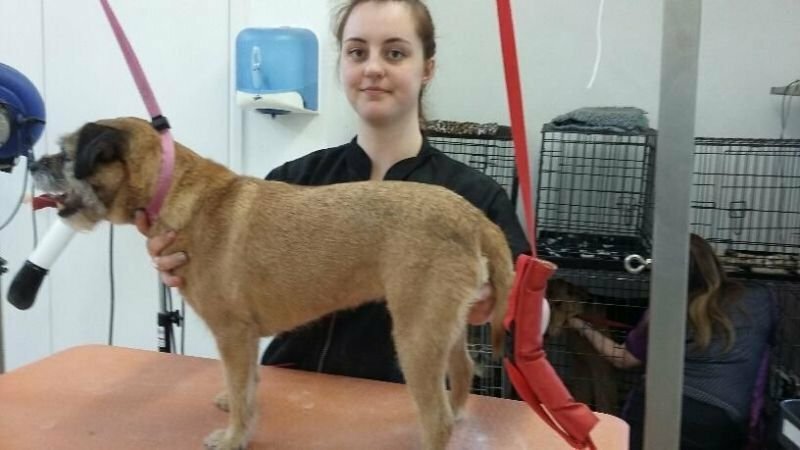 I have been grooming since 2013 when I joined Canis as an apprentice, but before that I trained at Abingdon and Witney College in Animal Care. Since joining Canis I have achieved my Level 2 apprentice qualification in Dog Grooming and I now hold the City & Guilds 7763-03 Certificate in Dog Grooming and I have passed the 7763-03 Practical Modules for Handstripping and English Cocker Spaniel. I was really excited by my first ever grooming competition in 2015 when I won first place in the Newcomers Handstrip Class at the British Dog Grooming Championships, and then went on to become Runner Up Newcomer of the Year. I won my award by handstripping a Border Terrier. My specialist skills are in handstripping, but also I like to work with the little dogs that are somehow a bit worried by being groomed - they seem to be very calm in my hands. I hold a current Pet First Aid Certificate. I am also the owner of a Beauceron (a large livestock guarding dog). Just like Judy, I am partial to a spot of G&T in the evening, but preferably one of the artisan made varieties!